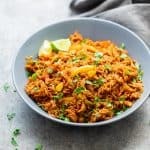 Seriously flavourful Instant Pot Mexican Rice is absolutely perfect as a vegetarian side, with tacos, as a filling for burritos and quesadillas or just by itself. We added corn and bell peppers so that this can also double up as a main. And the instant pot really takes the work out of making Mexican Rice at home. Did I tell you about the time we went to Mexico and actually ate real mexican food? Which was awesome. All the tacos in the world! Lots of grilled meats and I think the best bloody mary I’ve had so far! And there was a lot of mexican rice. It’s just a humble side dish that sits around to be paired with other things, and it’s really simple to taste but still delicious. Just an underlying hint of spice from jalapenos and tomato flavoured rice. This recipe is nothing like it because we like things spicay and we wanted mexican rice to stand out on its own. So I don’t claim authenticity here but this recipe is gooooood! Its flavourful, spicy and we added corn and bell peppers to make it more hearty. We used some ground chipotle chillies and cumin to spice this up. The chipotle adds a smoky flavour that’s really hard to beat. The key to well cooked, fluffy rice is to roast the rice before cooking. And that’s a trick I use every time I make rice – its the same trick I’ve used in vegetable pulao and jeera rice. It ensures that you have soft, fluffy rice every single time. It also adds a beautiful nutty flavour to rice and lentils. It’s important to know the right ratio of rice to liquid while making rice in a pressure cooker which is 1:2. That’s really all there is to it. In some cases, like this recipe the ratio will change slightly depending on the ingredients of the recipe. I love using the instant pot because it really locks in the liquid and flavour and doesn’t let too much escape in comparison to a traditional pressure cooker. An authentic mexican rice recipe (or Arroz Rojo) uses a very simple list of ingredients – onions, tomatoes, garlic, jalapeno and cilantro to flavour the rice. But we’ve decided to really spice things up here so that this instant pot mexican rice can also be served as a main if you wish. The flavour in this recipe comes from chipotle peppers, fresh tomato puree, cumin, garlic and peppers. It’s easy to reheat mexican rice. To re-heat in a microwave, just sprinkle a tablespoon or two of water all over the rice and microwave it for 1-2 minutes until heated through. The water creates steam which prevents the rice from drying out. If you are re-heating the entire batch, you can use the oven. Sprinkle a little water over the rice, and place the bowl of rice in a 150C/300F oven for 15-20 minutes. We make a big pot of this mexican rice in our instant pot and use it for everything – chicken fajita quesadillas (recipe coming up on Friday), as a filling in enchiladas and tacos and even as a dinner side with some grilled chicken or sautéed veggies! P.S. 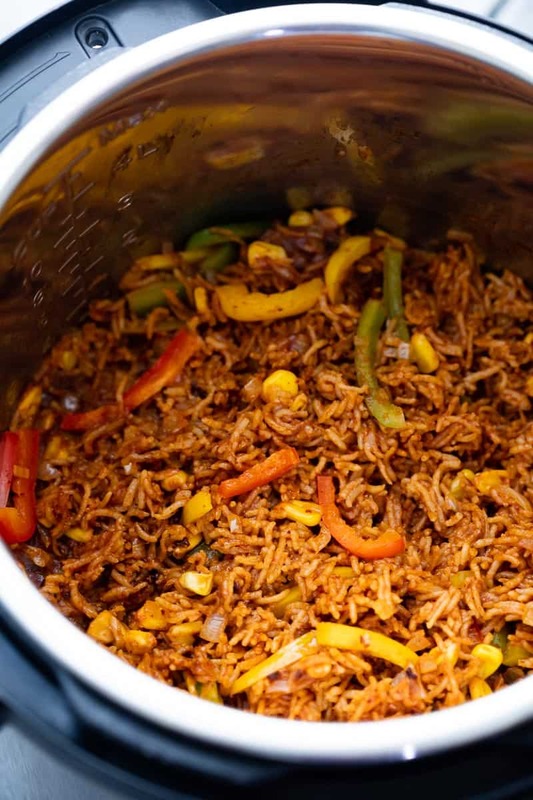 If you don’t have an instant pot, we have instructions to make this mexican rice on the stovetop and in a traditional pressure cooker too. But we love our instant pot and use it everyday. Here’s the instant pot we have if you want to check it out. Watch RECIPE VIDEO above. 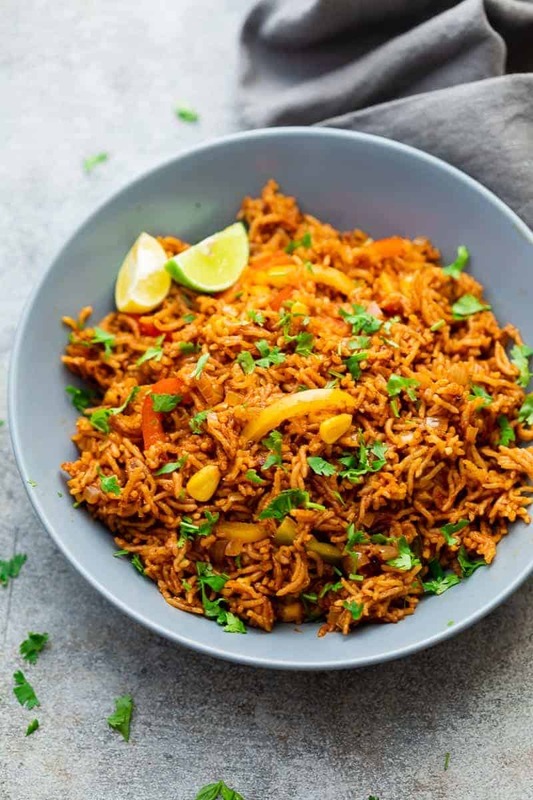 This Instant Pot Mexican Rice is incredibly flavourful, spicy and super versatile. It can be used as a filling for quesadillas, tacos, burritos, enchiladas or as a side dish with grilled chicken or veggies. We added some corn and bell peppers to make this recipe more hearty! Switch on the Instant Pot and turn on the saute function. Heat oil in the IP, add onions and garlic and cook stirring for 1-2 minutes till the onions are translucent. Add chipotle powder and rice and stir to coat the rice with the oil and onion mix. Roast the rice for at least 3-4 minutes, stirring occasionally. Add sweet corn, tomato puree, stock, cumin powder and salt. Give it a stir and close the IP and set on manual for 8 minutes. Once the 8 minute timer goes off, wait for five minutes and then release pressure manually. Gently stir in the bell peppers and close the lid again for 10 minutes. This will help steam and cook the peppers, while keeping them crunchy. Top with chopped coriander and sour cream to serve. Tomato Puree: To make tomato puree, add two medium sized tomatoes to a food processor, and process to a puree. Alternatively, you can also use 3/4 cup store bought tomato puree. Store bought puree is denser and more concentrated so we’ll use a little less. 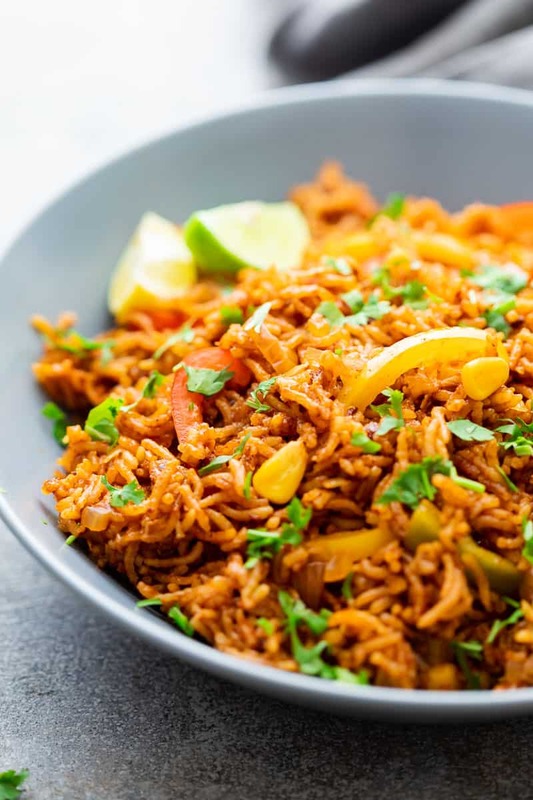 Brown Rice Mexican Rice: You can also use short grain brown rice to make mexican rice. For brown rice, increase the amount of vegetable stock to 2 cups, and pressure cook for 20 minutes. Stovetop Pressure Cooker: To cook the same recipe in a stove top pressure cooker, cook for 3 whistles and then take off heat. Let it sit for 10 minutes to let the pressure release by itself. Stir in bell peppers and cover and let it sit again for 10 minutes to let the peppers cook. I made this tonight, exactly as written—delicious ! I was so surprised by how much flavor was achieved from this relatively simple recipe. This is going on the regular rotation!! So glad you liked it Shelly! So happy you liked it Shelly! Waoo…A great Rice Recipe with an amazing flavor of corn and peppers…!